Lisa Scottoline’s brand-new thriller, Someone Knows, is being released the day before All Henrico Reads on April 9. Someone Knows is a dark mystery wrapped around a twenty-year-old secret. This compelling title tackles tough issues such as mental illness, suicide, and the lifelong consequences of one bad choice. Her legal thrillers have been favorites since she started her writing career 25 years ago, and Lisa has a great back catalog filled with great titles you can check out from the library. 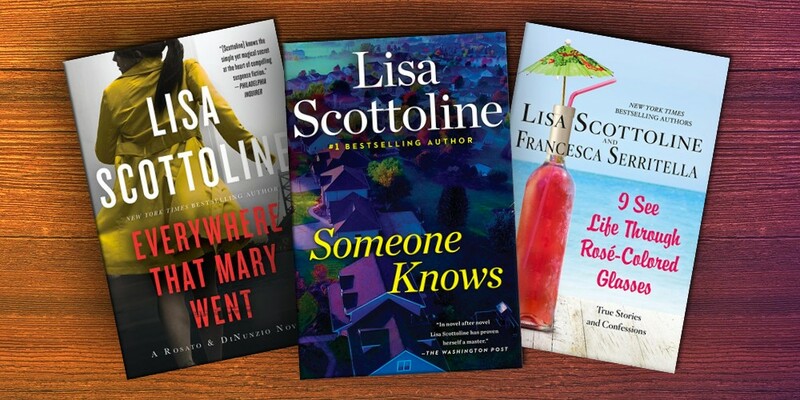 With the impeccable ability to create dynamic courtroom scenes and characters you want to revisit again and again, Scottoline’s Rosato & Associates series features vibrant mysteries that will keep you guessing. Start with Everywhere that Mary Went, and after you read this series, check out the follow-up series Rosato & DiNunzio. For a bit of a change, leave the suspense on the shelf and pick up one of her essay collections. Written with her daughter, Francesca Serritella, these books are full of wit and wisdom that is laugh-out-loud funny. We’d suggest starting with I See Life Through Rosé-Colored Glasses. You can check out these titles and other books by Lisa Scottoline here and be sure to join us on April 10 at Glen Allen High School for the main event! We will be giving away 300 signed copies of After Anna courtesy of the author. Limit one per household.